Mayor Rahm Emanuel's second inauguration will be scaled-back from the extravaganza that was held in 2011 but will include a weekend of community service projects and entertainment, the mayor's office announced Monday. The actual swearing-in ceremony for Emanuel and all 50 members of the Chicago City Council will be held at The Chicago Theater, at 10:30 a.m. on Monday, May 18. "The inauguration is a time to reflect on the hard work we’ve done, but also to look ahead to the opportunities we have as a city," Emanuel said in a statement. The first Inaugural, at the Jay Pritzker Pavilion in Millennium Park, had priority seating for donors, with the public invited to standing room only in the back. This time there is no priority seating, but the public must apply for a ticket online. 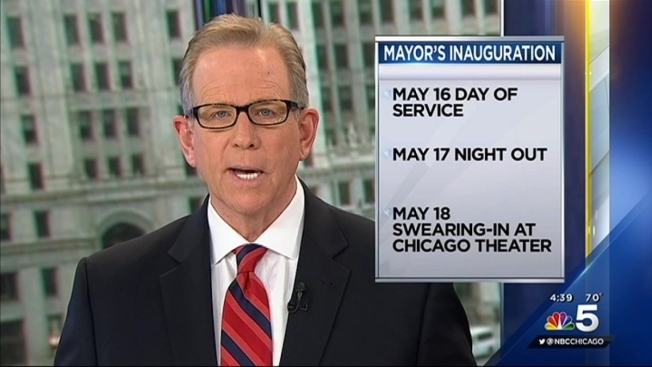 Also unlike in 2011: there will be no large gala or special parties, but a "public open house" will be held at Emanuel's office in City Hall for two hours following the inauguration. Saturday, May 16, has been set aside of a Day of Service. The list of volunteer opportunities was not published to the inaugural website -- CIC2015.org -- as of Monday afternoon, but Emanuel's press office said there would be opportunities in all 50 wards.. On Sunday, May 17, the city and the Chicago Park District will host a "Night Out in the Parks" event. That full schedule was also forthcoming.